The water bottle is BPA free, fits into standard cup holders, backpack pockets and bike cages, has a fast flow and stays clean thanks to the sturdy protection cap. The filter inside the SafeHydrate Water Filter bottle provides superior biological protection, high flows and long service life in a compact, lightweight, and easy to use cartridge. It works by using Electro-Positive Absorption Technology. Charged micro-glass fibres “pull” organisms as small as bacteria, out of the water stream while still maintaining high flow rates and low pressure drops. It has been thoroughly tested by independent laboratories, and proven to consistently remove protozoan cysts, and bacteria to ANSI/NSF – 53, and US EPA standards. The addition of sub-micron carbon particles into the water filter media increases the absorptive capability required to reduce chlorine and harmful chemicals, bad tastes and odours to ANSI/NSF – 42 standards. Simply fill the water bottle, replace the cap, and drink clean, fresh, filtered water wherever you are. No activation process required! Once the filter life (380L) expires the bottle simply stops working, assuring that you never drink untreated water through the system. The rugged lid also ensures the mouthpiece is protected from contamination. Water sources such as rivers, streams and lakes are safe to filter with SafeHydrate but seawater, brackish water and heavily chemically contaminated water should not be filtered. If the biological/viral quality of the water is poor we recommend you pre treat the water with Biox Aqua Tablets or Drops. Unscrew the cap and remove cap filter from the bottle. Fill water to approximately 35mm below the top and screw cap back on. Open cap and sip through the valve. Squeeze to accelerate flow. Wash after use with warm water and dish soap, or place on top rack of dishwasher. Clean the valve by pulling it from the top of the cap and washing it in the cutlery tray of a dishwasher. Allow to air dry before storing. 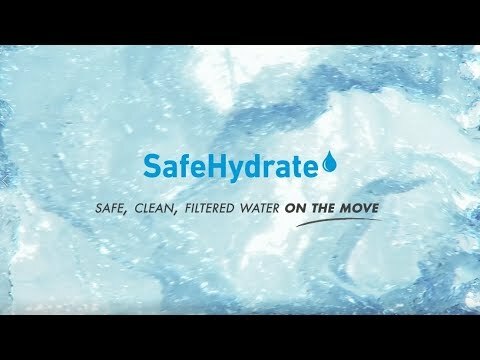 Has SafeHydrate been certified or approved? Yes, SafeHydrate has been thoroughly tested by independent laboratories, and proven to consistently remove protozoan cysts, and bacteria to ANSI/NSF 53 and US EPA Standards. The absorptive capability required to reduce chlorine and harmful chemicals, bad tastes and odours has also been approved to ANSI/NSF 42 standards. Can SafeHydrate filter any water? No. SafeHydrate should never be used to filter seawater, brackish water, or any water that is obviously heavily chemically contaminated. All other water sources are safe to filter with SafeHydrate e.g.rivers, streams, lakes etc. If the biological / viral quality of the water is poor or unkown, it is recommended that the water is pre treated with Pyramid Biox Aqua tablets or drops. How do I fill SafeHydrate? Unscrew the top from the bottle and them immerse the bottle in the water source. Screw the top back on to the bottle, making sure that the mouthpiece does not come into contact with any potentially contaminated water. How do I clean SafeHydrate? How should the filter be stored? The filter may be stored wet for under 30 days, but for longer term storage remove the filter from the bottle, remove excess water and allow to dry for 48 hours before storing in a cool dry location. Do not store a used filter in a sealed container or expose it to extreme temperatures. When should the SafeHydrate filter be replaced? The SafeHydrate filter is capable of filtering 380 litres of water, (approximately 580 refills of the bottle). Once this point has been reached, the filter should be replaced. This is an improvement on previous filter performance which may not have been reflected in the information on the packaging. What is the flow rate of SafeHydrate? Mountain Warehouse are the largest outdoor retailer in the UK with 200 stores nationwide selling quality outdoor gear for all the family. Established in 1997, Mountain Warehouse pride themselves on providing the best gear, the best prices and the best service to their growing number of customers. Mountain Warehouse also has an increasing number of stores internationally, with 10 stores in Poland, and the website ships to over 100 countries.